FIRST, it’s that time of year… Laura Carson is gearing up for her annual Halloween event, and this year is a Haunted Village!! NEXT, a new FREE gift! Inspired by Teri Calia’s tiny dollhouse inside a china cabinet — The White Rabbit’s Hutch, I kinda went crazy looking at our large stock of Alice in Wonderland Collage Sheets and picked out a few that work well shrunk down to 1/4 size! Tiny Alice Gift Sheets: one of these tiny wonders is FREE for all orders, regardless of order size! AND if you spend $20 or more on an order, I’ll send TWO! (That’s 2 different mini sheets — I’ve made a few!) If you place an all-digital order, I’ll send you a special Alice Gift Sheet as a pdf file. “Lady Divina, (also known as Jane Chester) after years of palm reading and crystal ball gazing, has packed up her side show tent and retired to the countryside. She found a lovely cottage with a view and spends lots of happy hours puttering away in the pretty little garden she’s planted there. If you are lucky enough to be asked to tea, Jane may take you on a little tour of her past. Against a long wall in her parlor is a large old cupboard where Jane keeps the memorabilia of her past life, including her crystal ball collection and the many bits and pieces that tell the story of a rich, full life. 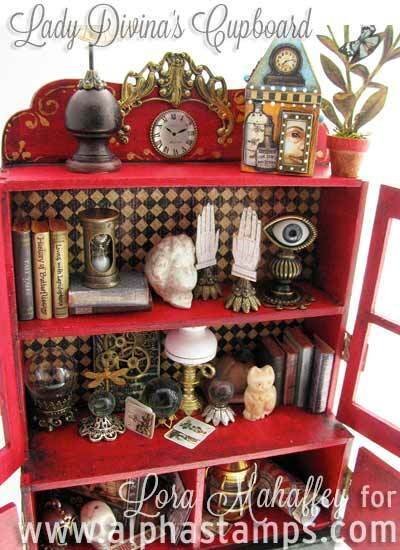 How cute is the Miniature China Cabinet that Lora used to house Lady Divina’s past? The cabinet is a flat kit, laser cut from heavy chipboard that is almost 1/8″ thick. It is supercalifragilousinexialidociously easy to assemble that requires any type of craft glue with a finished size of approx 5″ wide x 7″ tall. Can’t wait to get mine! And she’s made more artwork! Look at these adorable tiny houses Lora made; some of them are actually jewelry pins, too! They are all one inch wide and the tallest (the house with the tree and love birds) is two and a half inches. Because jewelry gets a lot of hard wear, Lora stuck to papers only for the pins and sealed them with an acrylic finish. These are a lot of fun and fairly quick to make. 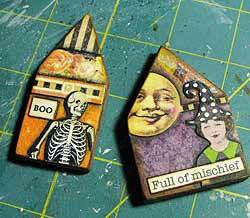 Since they are small, it’s a great way to use scraps and bits of paper and inchie collage sheets. Imagine some cute Christmas pins to give as gifts. They would also make adorable ornaments! See the little house with the clock on the top of Lady Divina’s cupboard? You could make loads of these for the holidays with the Small Wood House Shape and a pin back. Talk about easy! If you go to Lora’s blog, she will tell you how she assembled and achieved that luscious red color she used for the cupboard (and giving some handy tips as well too)! And you can view more photos in the Gallery. The White Rabbit’s Hutch: a tiny dollhouse inside a china cabinet! Oh my! What ideas this gives me! Teri Calia built a tiny, 1/4″ scale dollhouse INSIDE that same china cabinet (and gave it a white-washed, shabby chic finish so you might not recognize it as the same china cabinet Lora used). 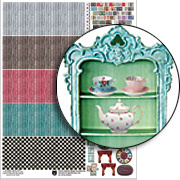 Teri always takes such care in choosing components for her collages… like the teaspoons as handles on the doors — and that tiny little cup of tea on top the hutch (also shown at left)! 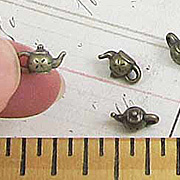 And adding little splashes of red to bronze charms, like that bow tie on the rabbit (see top right of the photo below). 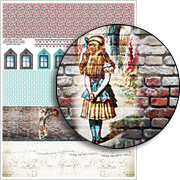 And Teri designed two new collage sheets with teeny, tiny papers and trims for making your own 1/4 scale dollhouse inside the Miniature China Cabinet (with an Alice in Wonderland/White Rabbit theme)! Note: 1/4 scale is also called 1:48 scale (“1/4 inch to 1 foot scale”… 4 times as small as the “1 inch to 1 foot scale” items in the 1:12 Dollhouse Section). 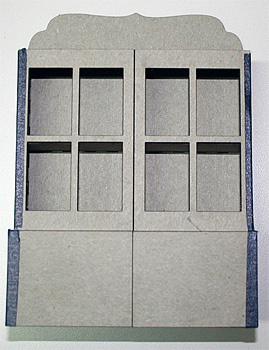 Plus, see below for some new 1/4 scale furniture and props! Here’s Teri’s supply list for the The White Rabbit’s Hutch and you can pay Teri a visit at her blog to read more (like Teri’s theory on why the rabbit is always late). You can also view lots more photos in the Gallery. NEW Goodies! Mainly in 1/4 Scale! ALL on Sale! August 20th, 2015 at 7:27 am. August 20th, 2015 at 7:28 am. Simply put 1000% adorable! I’d make a teeny, tiny diorama, with a tiny, antique frozen Charlotte doll. August 20th, 2015 at 7:30 am. August 20th, 2015 at 7:31 am. I adore the collages. such very talented artists!! looks like so much fun to assemble and decorate…….ahhhhh to be a child again!! Bessings to all! I LOVE this dollhouse giveaway! I think I’d make a tiny dollhouse for my miniatures display shelf. August 20th, 2015 at 7:32 am. I/4 size is not a scale I tend to work with unless I’m making jewelry (or bejeweling another piece). However, I’d like to see how these items integrate into cityscapes. How can I push it beyond what it seems to be? I really love the clocks. (Clocks, gears, iron bits, stencils) but when I see work like the haunted house (above), I really get drawn in. August 20th, 2015 at 7:33 am. OH!!! I want, no I NEED, all of these fabulous miniatures! I am building a Fairy village and these would all be so fabulous to use in it!! Please don’t stop carrying and adding to the miniatures that you have!!! Hoping that one day soon I can afford to go on a mini shopping spree and get some goodies to embellish my village! I really need to add at least one or two of these china cabinets to the village also!! THANK YOU for the chance to have these minis on their way to me!! August 20th, 2015 at 7:36 am. Oh I just love, love, love everything about that hutch!!! So fabulous! Thanks for a great giveaway. August 20th, 2015 at 7:39 am. I really love the white rabbit’s hutch by Teri Calia. It’s so darn cute!! I would really like to make my own version, or maybe I would use a small doll house and make a big Alice for it so that it would be just like the story. I don’t know if I would use more of the 1/4 scale items. I guess it just depends on what projects I can come up with. Thanks for the inspiration today and every week!! August 20th, 2015 at 7:45 am. artifacts. A friend visited London and brought me a pencil with a silver metal White Rabbit topper at the Alice shop near Oxford – it is a prized posession! August 20th, 2015 at 7:46 am. Oh my goddess! You guys always have the best collections! I’d use them for my wonky mini-vignettes. Thanks! August 20th, 2015 at 7:48 am. 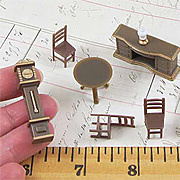 Just love the miniature furniture and would love to try an altered clock with them. August 20th, 2015 at 7:57 am. I just love it (as usual)! LOL, I have not worked with the 1/4 size miniatures, but would like to start. They look so cute in the china cabinet! Thank you for this opportunity! August 20th, 2015 at 7:59 am. Love it. The chipboard is pretty amazing, considering they only sold basic shapes a few years ago. I especially like the teacup with tea in it, and the tiny houses. August 20th, 2015 at 8:00 am. August 20th, 2015 at 8:05 am. OMG! I do dollhouses. Never have I done 1/4. OMG! Please let me win. Love what you’ve done with these items. August 20th, 2015 at 8:07 am. Love those fun houses and pins! I use minis mostly on cards and ATCs, and other paper arts projects! August 20th, 2015 at 8:13 am. I love them! I’ve been wanting to make a diorama inside a silver jewelry case I have. I think these would be perfect! August 20th, 2015 at 8:16 am. I love all the items, especially the 1/4 scale furniture. It’s so hard to find true to scale. I like it for snowglobe scenes and other micro-mini displays. Would love to win this giveaway – expecting a new little niece this fall and it would make an adorable shadowbox display for her room. August 20th, 2015 at 8:28 am. August 20th, 2015 at 8:29 am. OMG! I LOVE these miniatures! 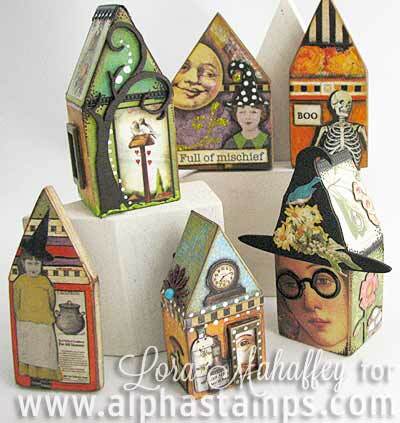 I would make several mini houses with these materials – a witch house, a fairy house, an Alice house, a mouse house – i could do a lot of things with these pieces! Yes, please! More miniatures! this is priceless. amazing! gotta have. August 20th, 2015 at 8:32 am. August 20th, 2015 at 8:35 am. Well, since I have a friend who loves Alice, I would have to make her something fabulous, but I seriously would use the furniture to make a Night Before Christmas house! August 20th, 2015 at 8:40 am. Who doesn’t love Alice? I would make a diorama using a vintage box, I have been saving for a special purpose. August 20th, 2015 at 8:44 am. Just love love this mini dollhouse and the Alice in Wonderland theme is fantastic. August 20th, 2015 at 8:46 am. Oh my! I would have to go Transylvanian with this. Imagine Drac and company sharing a tiny abode. Heh! August 20th, 2015 at 8:55 am. I would love to “gift” this kit to my friend who is crazy for Alice “anything”! August 20th, 2015 at 9:04 am. August 20th, 2015 at 9:14 am. Adorable! On the cute-ness scale, this ranks just after babies and puppies! I’ve built 1:12 dollhouses and furnishings, but this teeny-tiny hutch would be fabulous with a Christmas setting. Sure would love to win! August 20th, 2015 at 9:32 am. I have an old doll house that I’m turning into a haunted house. 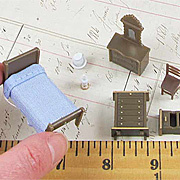 So I would use the miniature furniture to make an abandoned dollhouse inside the larger dollhouse. It would be in the little girl’s room – dusty and forgotten…..
August 20th, 2015 at 9:33 am. 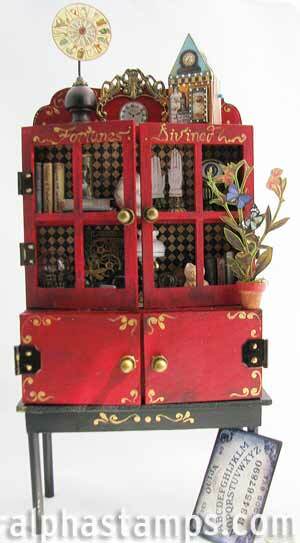 I would love to make a shadow box with all the wonderful miniature furniture. What fun! August 20th, 2015 at 9:50 am. Those are insanely beautiful! Tea party! Tea party! Tea party! Tea party! August 20th, 2015 at 10:13 am. I love the White Rabbit’s Hutch! I am currently making a Victorian dollhouse and I love the idea of a dollhouse in the dollhouse!!! I would love to see more in the 1/4th scale!! August 20th, 2015 at 10:14 am. love the little things! I’d make an Alice charm bracelet! August 20th, 2015 at 10:22 am. Oooh I can see myself making a mini rabbit hole with all of these awesome minis! August 20th, 2015 at 10:34 am. Quarter scale miniatures is my world. I build quarter scale houses, and this giveaway is a perfect complement for my miniatures. I would love to see more quarter scale items. Love it !!! August 20th, 2015 at 10:48 am. I am in heaven right now, tiny furniture is right up my alley. You have hit the mark with this giveaway. August 20th, 2015 at 10:58 am. I would make a mini Alice in Wonderland dollhouse. August 20th, 2015 at 11:14 am. I love this giveaway. My favorite themes are miniatures and the tiny little hutches. I would try and build a little mini house and load it up with all your minis that you have in your store. August 20th, 2015 at 11:15 am. 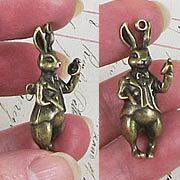 The watch piece and rabbit would be “Wonderful” to embellish a invitation to a party. August 20th, 2015 at 11:50 am. I quite like the idea of the rabbit hutch tho I might try to make it into the Mad Hatter’s Tea House instead. 1/4 inch minis are great! Keep em coming! August 20th, 2015 at 11:54 am. Oh my, so in love with all the minis! My new hobby is Altoid tin dioramas and I can vision using all of these in one way or another to embellish. They are great! August 20th, 2015 at 11:55 am. These are so cute! I would make a little house for Alice! August 20th, 2015 at 12:14 pm. I love dollhouses and would love to do one, however, my apartment is beyond small so I have no room, I love the idea of the dollhouse in the cabinet. I think I’d have to make it a Halloween dollhouse, just because it’s my favorite holiday. Thanks for the great idea. August 20th, 2015 at 12:33 pm. I have this amazing Alice as Queen tattoo on my right arm and I’d LOVE to make this cabinet to go with it!! August 20th, 2015 at 12:42 pm. OMG,,,I just love the fact you are even considering doing dollhouse miniatures. LOVE, LOVE!!! I have been into this exciting craft for only 2 years and am always on look out for new ideas and products. Looking forward to what you come up with, as I am already a big fan. Thank you for considering me in your give away. August 20th, 2015 at 1:04 pm. I am weak in the knees looking at all the goodies in this giveaway. 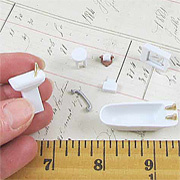 The tiny dollhouse bits are so wonderful and will lead to hours of creative creating! And I just adore the White Rabbit. He is a favorite character of mine. August 20th, 2015 at 1:23 pm. Rabbits and tea and a dollhouse, oh my! I simply must put my gothic spin on this idea of a house inside a cabinet… or I’ll go MAD!!! August 20th, 2015 at 1:24 pm. I have been dying to make some Alice projects and these are adorable!Love it all! August 20th, 2015 at 1:31 pm. Fun giveaway! I like both hutch displays and the house shaped pins are fabulous. I’m thinking of a Night Before Christmas mouse house. Love the 1/4 scale because they will fit in that “perfect” little container you spot on your treasure hunts. August 20th, 2015 at 1:42 pm. I love this! I would have to make a dollhouse out of all of it. I would make a cylinder with all the little rooms inside as if it was what Alice saw when she was falling down the rabbit hole. Thank you for the opportunity to win. I’m keeping my fingers crossed! August 20th, 2015 at 1:54 pm. I would love to make an Alice in Wonderland hutch for my granddaughter’s birthday Sept. 29. Thanks for the chance. August 20th, 2015 at 2:19 pm. I’d love to use the charms in the special earrings I make, it all looks so amazing that I don’t know where I would start with all the fun of creation! August 20th, 2015 at 2:55 pm. These miniatures could be use in so many places. August 20th, 2015 at 3:02 pm. With all those adorable teeny, tiny things this is a fabulous giveaway. I would love to make a tiny dollhouse. August 20th, 2015 at 3:09 pm. How wonderful… I’d make jewelry or a rabbit house or a fairy clubhouse. August 20th, 2015 at 3:16 pm. I love this! Would be a great gift for a dear friend named Alice!! August 20th, 2015 at 3:47 pm. Oh, I think I would use some of them to make an altered board book with small niches in it. I could use some of the vintage Alice in Wonderland books I have for backgrounds too. August 20th, 2015 at 4:57 pm. Love, love, love the 1/4 scale! Perfect for my full size imagination! I’m working on altered books and alters. These are just right! Thanks for continuing to inspire me. August 20th, 2015 at 5:45 pm. I would love to build a room (maybe on a bookshelf) and decorate with these. August 20th, 2015 at 5:55 pm. Lots of black and white squares and red hearts rolling around in my head! Thanks for the chance to win! August 20th, 2015 at 6:31 pm. I am obsessed with miniature anything! Love it all. I think I would probably lift the miniature in a curio idea and put my own spin on it! 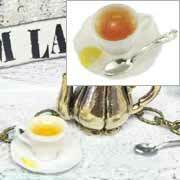 I am so thrilled with all the miniatures and accessories you offer! Thanks! August 20th, 2015 at 6:53 pm. I have never worked on anything this small, but would love to give it a try. All these minis have great details to them. August 20th, 2015 at 6:59 pm. can you even? These are adorable projects and I love minis! August 20th, 2015 at 7:43 pm. I can see making a little rabbit hole house! How wonderful! I’ve never worked with anything this small- I would also like to make a little mouse matchbox house! The ideas are endless! August 20th, 2015 at 8:00 pm. Oh I have been waiting for items of this size. I’m working on a 1:4 scale fairy garden and with these items I would also create a tiny dollhouse too. I love these tiny objects!! Thank you for your generosity!! August 20th, 2015 at 8:01 pm. I’ve enjoyed working with 1:48 before. I’d love to make my own dollhouse in a cabinet! August 20th, 2015 at 8:14 pm. These miniatures are fantastic! I would make the china cupboard with a variety of miniatures you show. I love the little teapots and the Alice in Wonderland theme. I don’t know about the 1/4 size-I’d love to try it. August 20th, 2015 at 8:56 pm. I LOVE IT!! 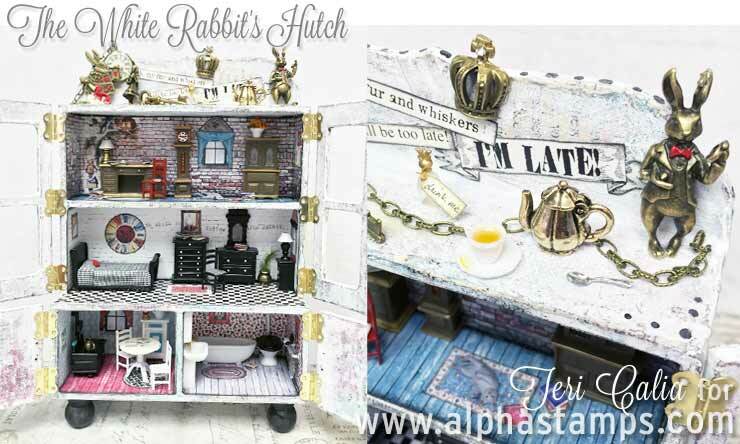 Teri’s White Rabbit Hutch is so amazing and I LOVE all of the charms for Alice in Wonderland!!!! What an amazing giveaway!!! Thank you for the chance to win!!! August 20th, 2015 at 9:40 pm. I love, love Alice in Wonderland!! You could do lots of stuff with the tiny size like fairy domains and mini dollhouses and of course the White Rabbit hutch!! August 20th, 2015 at 9:58 pm. August 20th, 2015 at 10:19 pm. oh what a wonderful giveaway!! So many ideas on what I would do with it if I won! I’ve always loved Alice in Wonderland and miniatures! I think I would have to make a version of “Down The Rabbit Hole” in a tear shaped glass terrarium I purchased and have no idea what to do with until now. ;-) thanks for the opportunity to win this awesome giveaway! August 21st, 2015 at 3:59 am. I would love to have these!! And I would definitely use them in a tiny dollhouse. I love this tiny size so I would definitely be interested in seeing more of it. I have 2 of those house shrines coming and I would put a tiny dollhouse in one of them :)This size would be wonderful in teacup gardens too. And I love Alice for many many years now. It is so neat to see so much Alice relayed fun stuff. August 21st, 2015 at 4:29 am. I just love miniatures! I have a small home so anytime I can display artwork that doesn’t require a lot of space is definitely a win-win for me. I just love the white rabbit theme. August 21st, 2015 at 5:01 am. Oh my, I must win this set. My sister is a collector of all things “Alice” and I just love creating fun things to add to her collection. August 21st, 2015 at 5:02 am. My wish list for you is growing! I would probably do something similiar, ie turn a shelf into a mini dollhouse. I have worked in 1/4 scale before, just not very much. I getting ready to go to a Fun Day in Gulf Shores where I will create a 1/2 scale bedroom. August 21st, 2015 at 5:07 am. I would most likely make a miniature dollhouse with these items. August 21st, 2015 at 5:28 am. Loving all the new miniatures! So fun to use in so many different ways. August 21st, 2015 at 6:18 am. I would use these goodies in my little glass boxes. What fun! August 21st, 2015 at 6:34 am. Sooo Cute! I think I would make a lively bedtime scene with baby bunnies getting ready for bed and momma bunny trying to read a story to them. Awwww…these mini’s are super cute! August 21st, 2015 at 7:56 am. Oooohhh! I’d totally make a tea party shrine! August 21st, 2015 at 10:07 am. I just want to add that you are driving me crazy with all this great stuff. I just opened a package from you and now I need more. August 21st, 2015 at 10:40 am. This is so amazing! 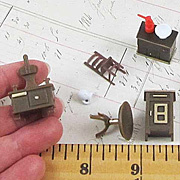 I love the teeny tiny things and I would adore making a little dollhouse like that. August 21st, 2015 at 12:03 pm. I love dollhouses would love to win anything love your company!! August 21st, 2015 at 12:54 pm. the charms and mini furniture would make a nice 3D card! August 21st, 2015 at 1:59 pm. 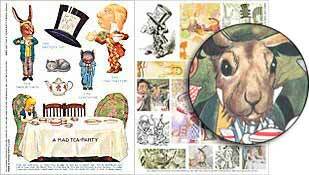 We are having a Mad Hatter Tea and I would love to make some of the items for gifts to the special guests. August 21st, 2015 at 2:18 pm. I love Alice In Wonderland and I love accessories for my doll collection. I have an Alice Liddell doll and wardrobe that I have been working on this year. This cabinet house would be the perfect addition to that project! I love it!!!!!!!!!!!!!!!!!!!!!!!!!!!!!!!!!!! August 21st, 2015 at 2:20 pm. Oh my goodness! I am falling down the rabbit hole. Fantastically inspiring! August 21st, 2015 at 4:03 pm. I am a miniaturist and would love to win this! August 21st, 2015 at 5:36 pm. Love the tiny scale furniture. It would be the nicest furniture I have, and easy to move;) It would be great for a mini Victorian Christmas scene. August 21st, 2015 at 7:05 pm. I have always been captivated by tiny versions of the world! Perhaps that’s why my birthday present this year was Chagall, a chihuahua! Currently I am amused by my 1:12 dollhouse in a bookcase and would love to incorporate these tinier elements to layer the surreal qualities of miniatures to reflect my own idiosyncratic life! Thank you for the opportunity to see kindred spirits! August 21st, 2015 at 7:21 pm. August 21st, 2015 at 8:20 pm.